This is the style of Rome apartment we love. Classic styling, frescoes and elegance. The Rondanini apartment is a new addition to our collection, we are sure you will love it. 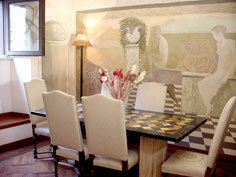 From the interior elegance to the location in the antique forum area, you will be breathing Rome direct from antiquity.